Sr0.5Ni0.5LaxFe12 − xO19 (x = 0, 0.08, 0.16, and 0.24) hexaferrites have been synthesized by ball-milling-assisted ceramic process. The calcined samples are characterized by X-ray powder diffraction (XRD), scanning electron microscopy (SEM), Fourier transform infrared spectra (FTIR), and vibrating sample magnetometry (VSM). XRD reveals that all samples consist of the main M-type hexagonal Sr ferrite phase and a low amount of rhombohedral Fe2O3 as secondary phase, and a continuous increase of the hexagonal lattice parameters with substitution content (x). Magnetic characterization indicates that all Sr0.5Ni0.5LaxFe12 − xO19 samples have a hard magnetic property. 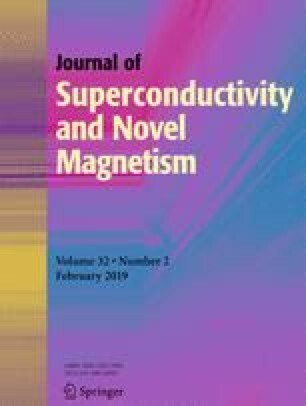 Substitution of Fe3+ ions by La3+ ions can obviously improve the specific saturation magnetization, remanence, magnetic moment, and effective anisotropy constant. Specific saturation magnetization, remanence, and the magnetic moment reach a maximum at \(x =\) 0.24 and calcination temperature of 1050 ∘C. This study was financially supported by the Guangxi Natural Science Foundation of China (Grant Nos. 2016GXNSFDA380034, 2017GXNSFAA198338), Innovation Project of Guangxi Graduate Education (Grant No. YCBZ2018009), and the Guangxi University Student Innovation Foundation of China (Grant No. 201810593187).